Evlyn Farris (1878-1971) was a woman of indomitable spirit and vision. A Maritimer by birth and education, she grew up believing in educational equality and the responsibility of the educated to lead. Evlyn understood the potential of women’s contributions to society and began organizing women to lobby government for equal rights and opportunities. She saw inequality between men and women as one of the reasons society was slow to progress and for women to be effective they needed to unite their forces! Evlyn Fenwick Farris (1878-1971). Education was central to Evlyn. Before the turn of the century she earned a BA and MA from Acadia University and taught in New England for six years. She believed women could hold their own intellectually with men and was determined to make a difference in the world. In 1905 Evlyn and her family moved to Vancouver, BC. 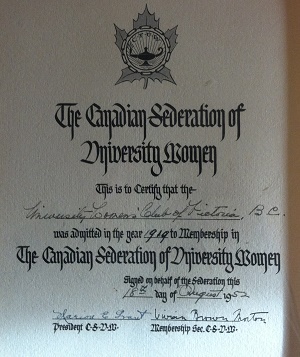 In the spring of 1907 she had met other university women graduates and they established the University Women’s Club of Vancouver on May 11, 1907. Evlyn becoming the first president of the Vancouver club and held that position until 1910. Evlyn had many influences on the rights of women and their ability to access education. 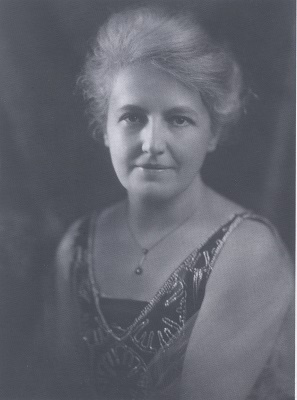 In addition to her numerous community contributions, Evlyn became the first woman in Canada to sit on the Board of Governors of a University when she was appointed to that of UBC in 1917 and she held this position until 1942! She was awarded two honorary doctorates one from her alma mater – Acadia and one from UBC (1942). She died in 1971 at the age of 93 years. Sylvie McClean tells her full story in her book “A Woman of Influence” (1997). In May 1908 Evlyn came to Victoria to meet with a group of university graduates to encourage them to organize a similar club on Vancouver Island. At this time there was an existing University Women’s Club in Toronto and the Vancouver Club was the second of its kind in Canada. Victoria became the third University Women’s Club in 1909. The first Executive of the UWC of Victoria was elected on 7th November 1908 with Rosalind Young as the first President of the Victoria Club – a position she held for three years, until being succeeded by Madge Watt. Sixteen women met during the summer of 1908 to discuss and complete the work of founding the Club.Twelve of the women had received their degrees from Canadian universities (Toronto, Dalhousie, McGill and Queen’s) and one of the twelve had gone to Edinburgh to obtain her medical degree; the other four, born in the USA, received their degrees from American institutions.Of the Canadians, eight were born in Ontario, three in Nova Scotia and one in Quebec. It is obvious then that were other factors operating that drew them to Victoria where they were all immigrants! (Special thanks to Gloria Dorrance, former President of CFUW Victoria, former CFUW Victoria Scholarship & Bursary Chair and current Club Archivist, Audrey Thomas, former President of CFUW Victoria and former CFUW Victoria Scholarship & Bursary Chair and Paula Cox, CFUW member for their contributions to the documentation of our history).